The Park Become a Hamilton Park 1st Friend! 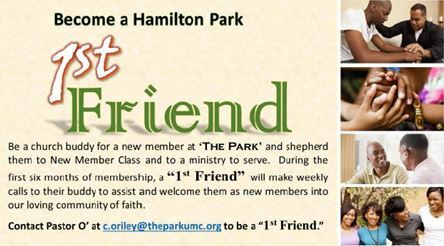 Become a Hamilton Park 1st Friend! Be a church buddy for a new member at The Park! Be a church buddy for a new member at The Park and shepherd them to New Member Class and to a ministry to serve. During the first six months of membership, a “1st Friend” will make weekly calls to their buddy to assist and welcome them as new members into our loving community of faith.